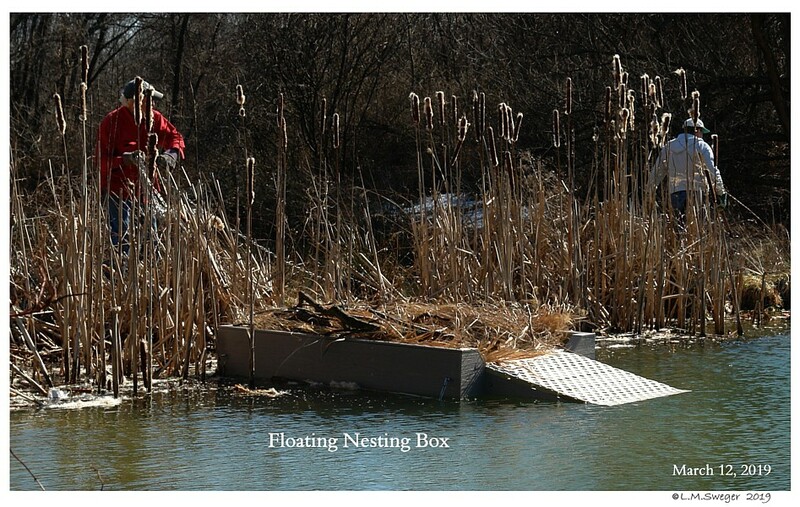 These will GREATLY improve Survival for Nesting Females. 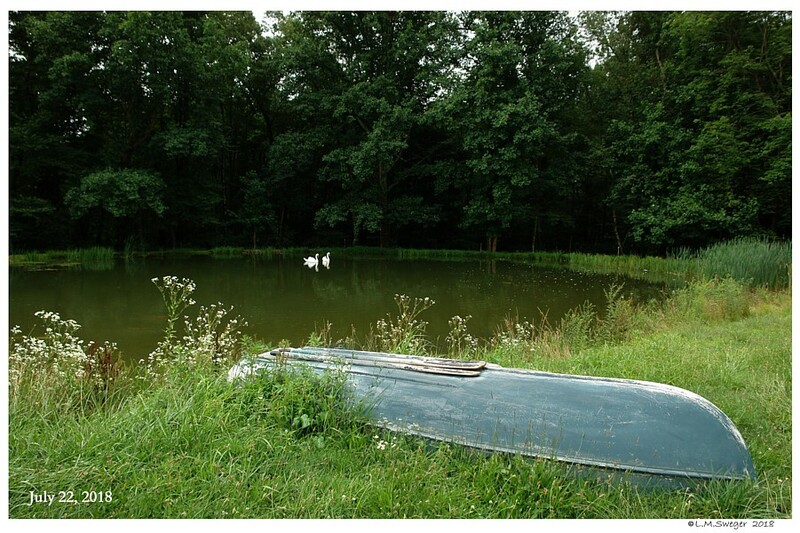 To Enlarge Images – Right Click – Open in a New Tab. 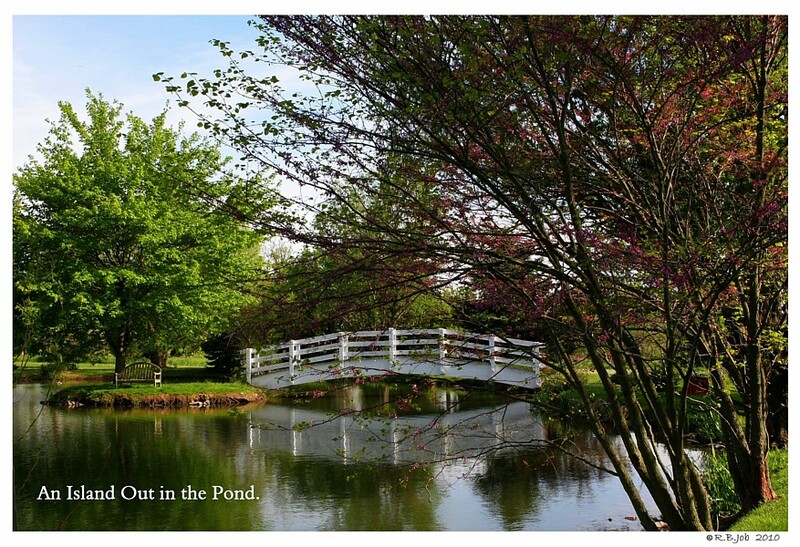 As Hints of Spring are ALL Around. IT is that Time Again. 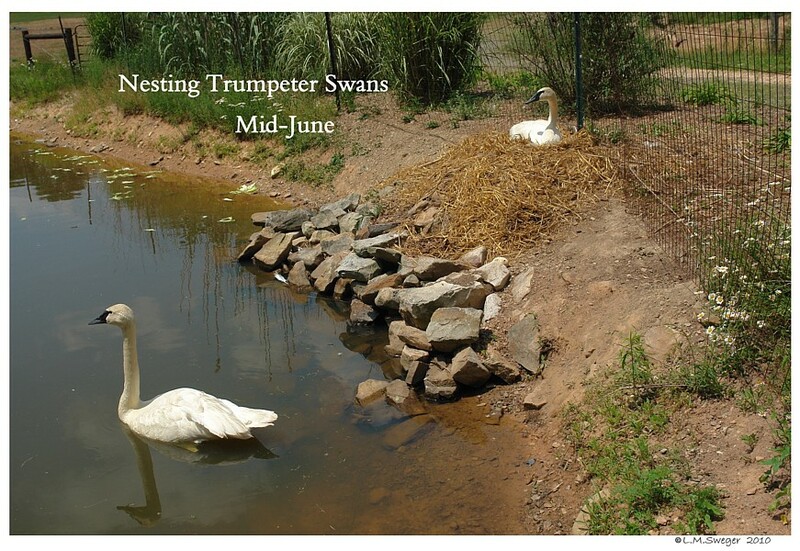 NESTING for Most Birds and Swans. 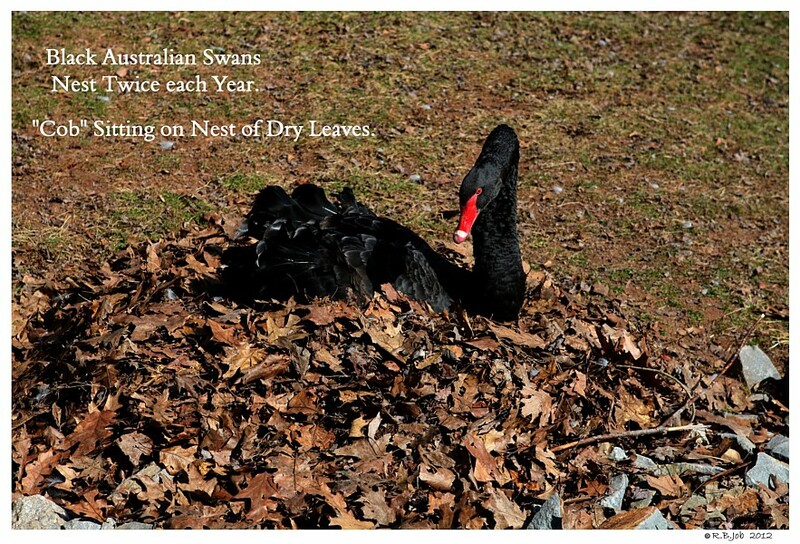 Many Native WildLife will have Young to Feed. Eagles, Hawks, Owls, Bears, Coyotes, Coywolves, Fox, etc. 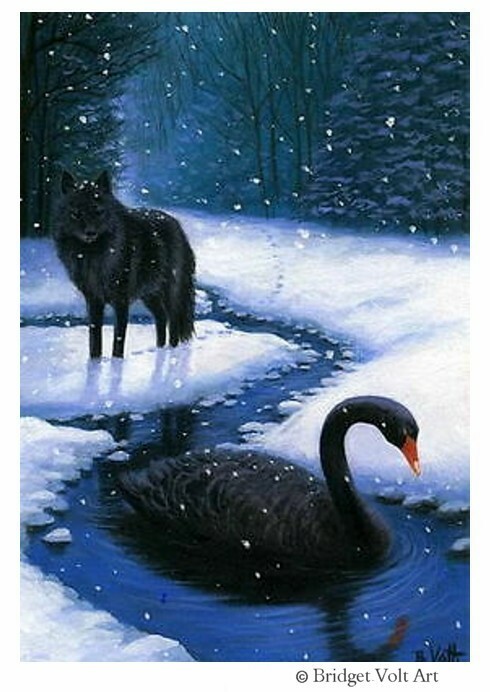 Unfortunately this means Vulnerable Swans will become Prey. 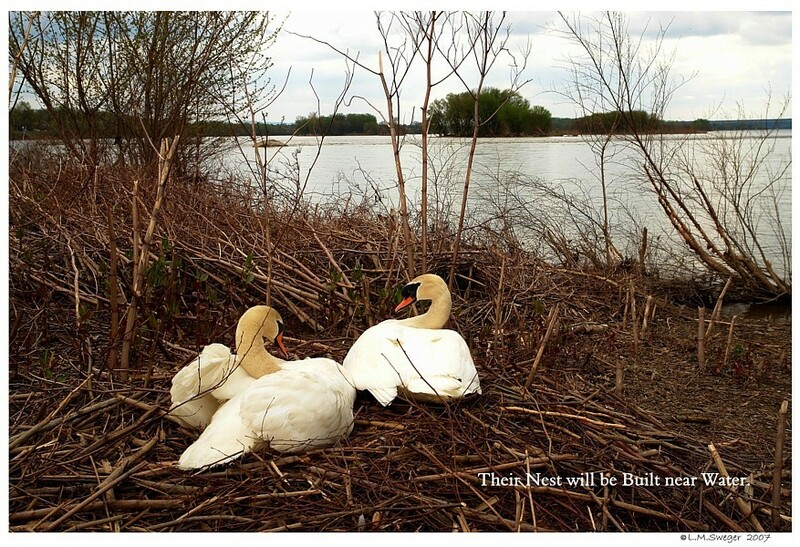 Watching Swans through their Nesting Season is Interesting. 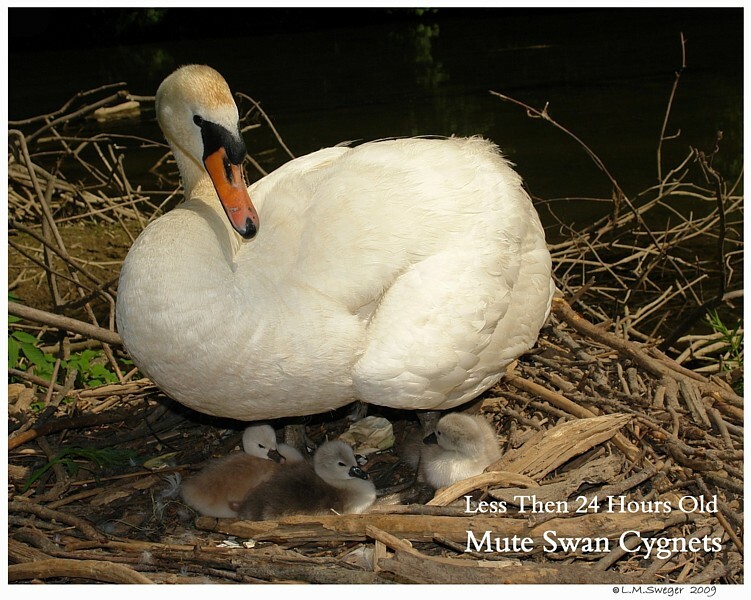 Each Species of Swans have Different Timing and Nesting Behaviors. 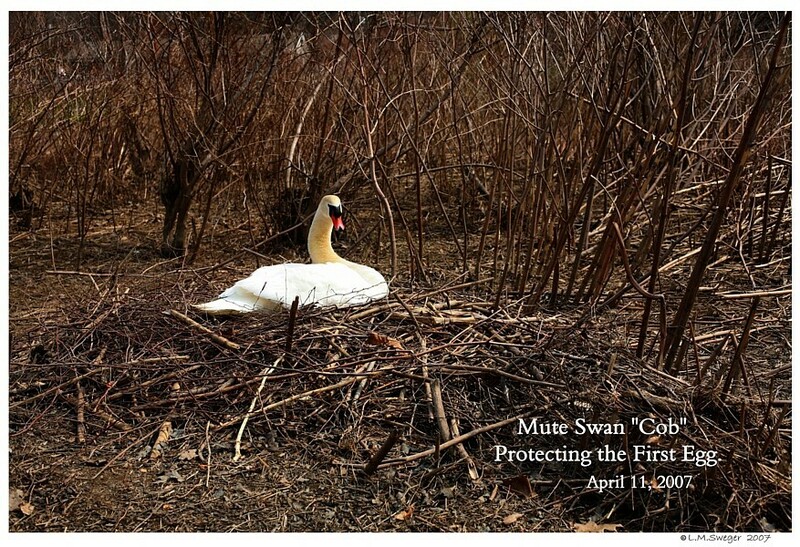 In Early March Mute Swans are Checking for a Nest Location. They Gather Piles of Materials for One to Two Weeks. 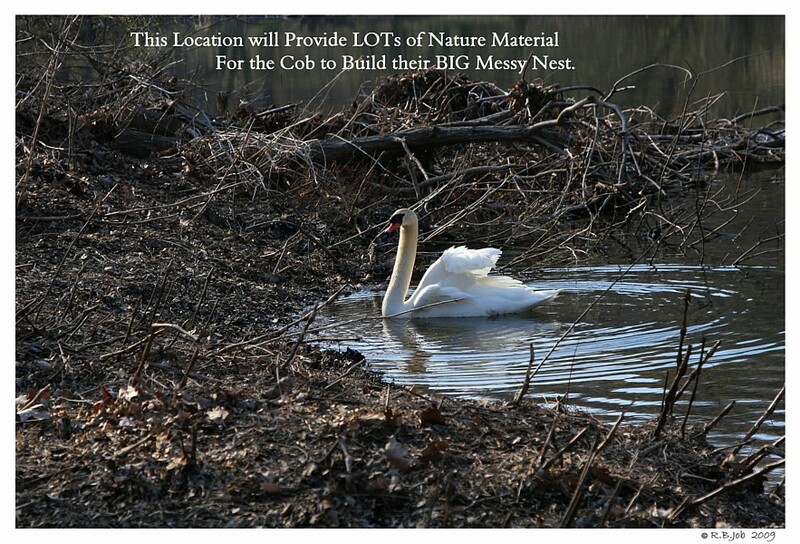 The Cob Builds a BIG Messy Nest. 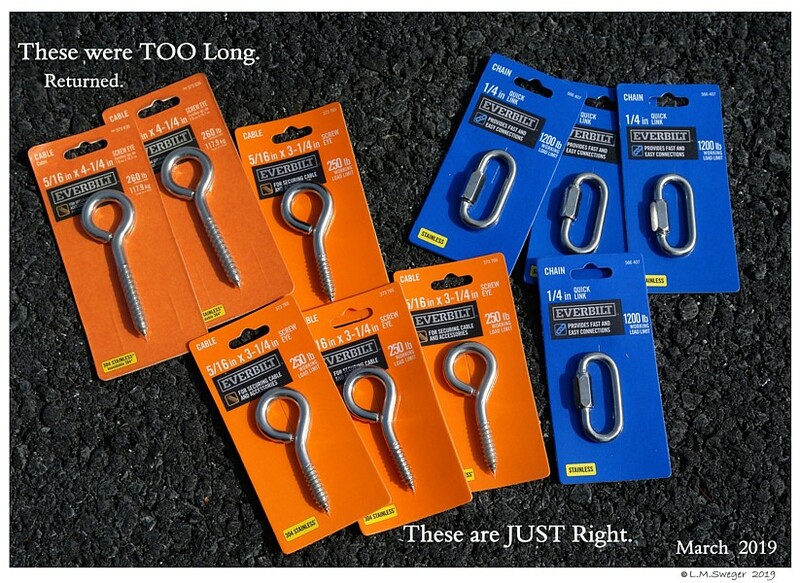 And/Or the Pen will Pull together a Soft Cavity Nest. 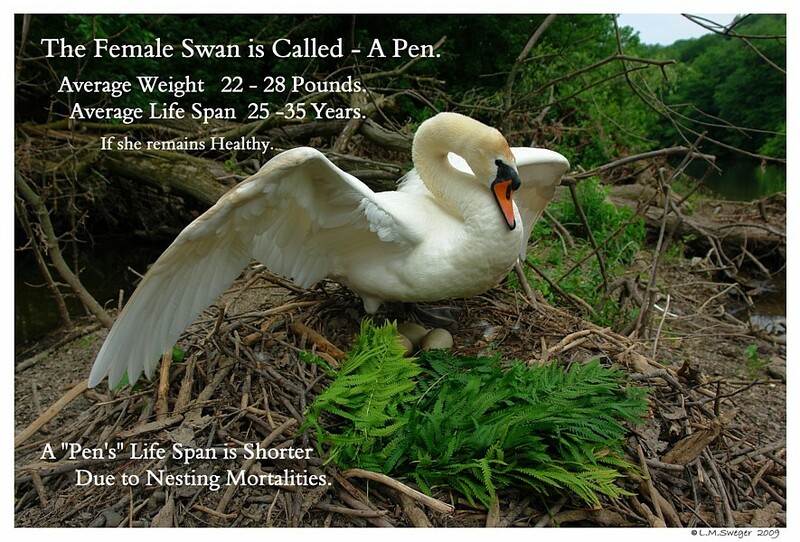 The Pen will be EATING as she Prepares for Nesting. 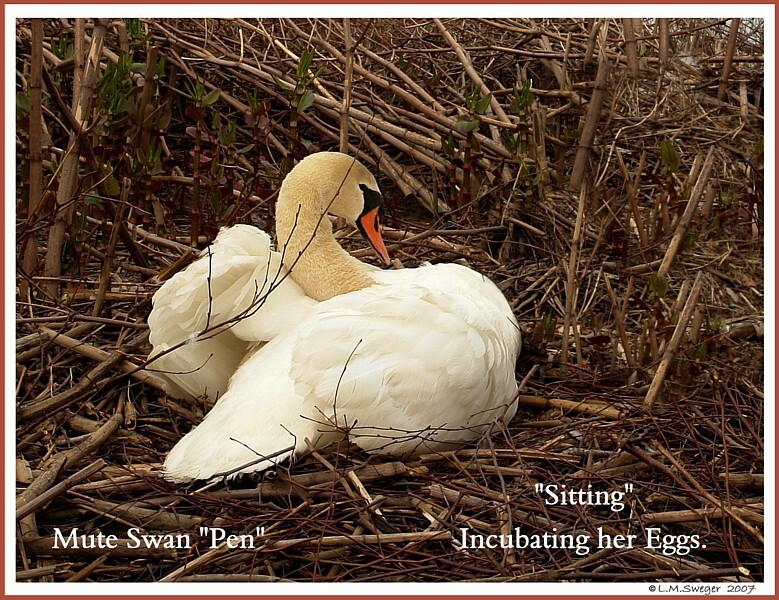 The Pen will “Sit” Full-Time 37 Days for Fertile Eggs to Hatch. 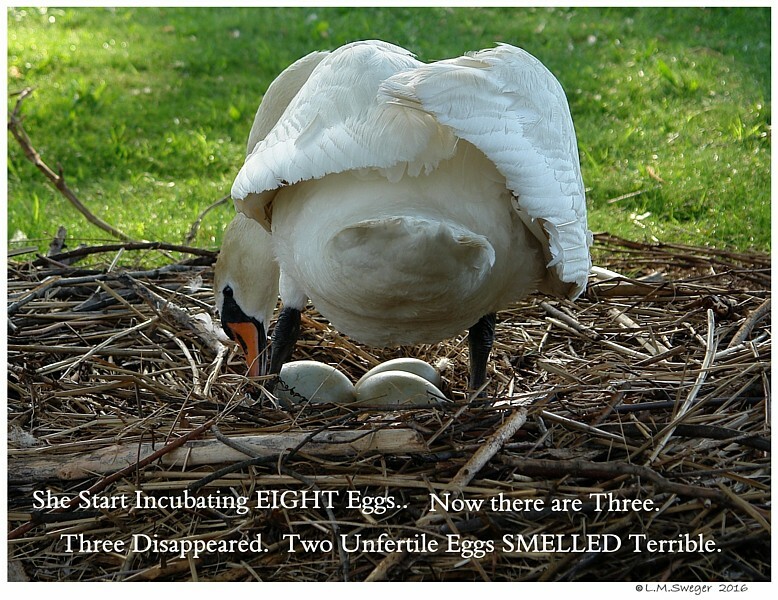 A VERY Vulnerable Time for Female Swans. 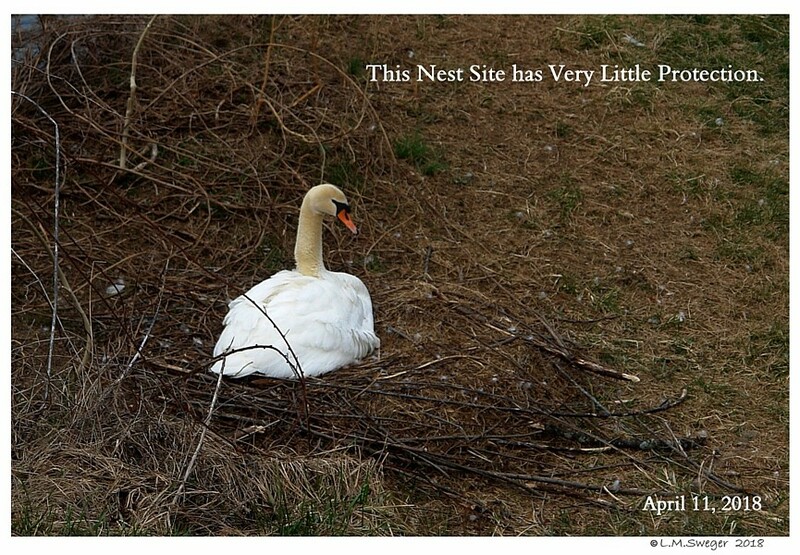 Concern for our Nesting Swans has Increased. I decided to Presume this Project Several Months Ago. 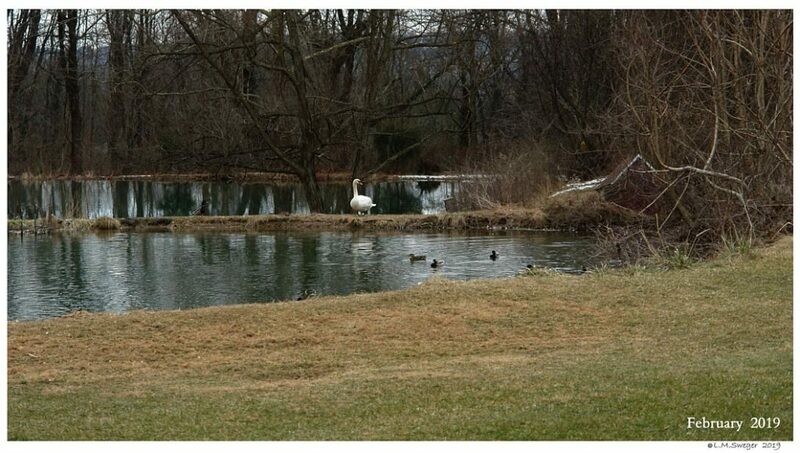 The Pond where our Swans are, has a Sheep Pasture on One Side. 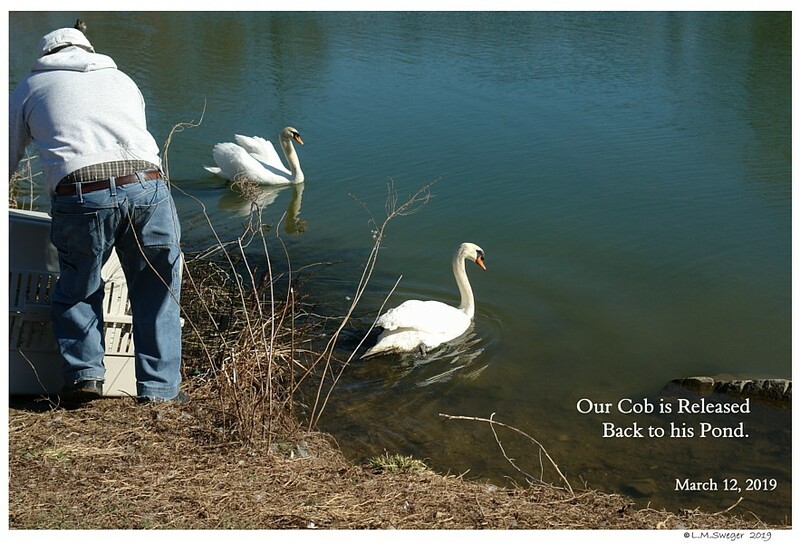 as I Talk with other Swan Folks. This is Occuring ALL Over PA and Many other Eastern States. 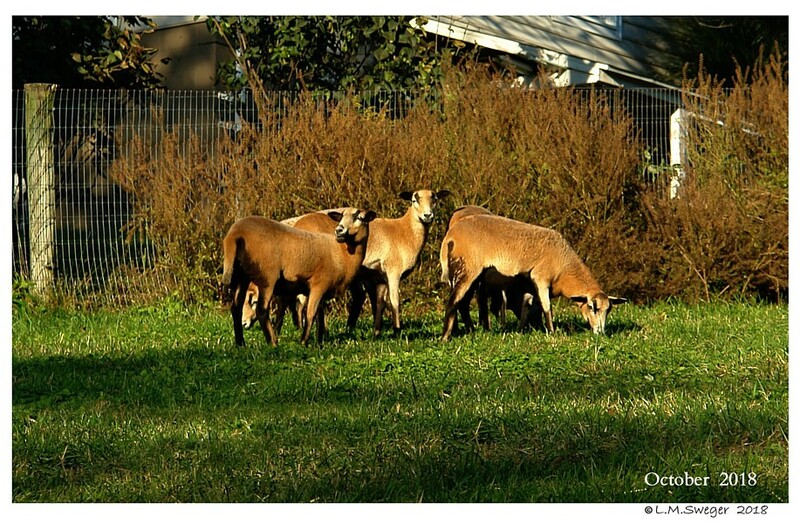 During the Last Months of 2018, some Large Predators dug under the Pasture Fence and Attacked ALL and Kills several of the Sheep. It was SO Sad. And a Real Eye Opener for All of Us. These Large Hybrid Canines are Increasing in Numbers Every Year. 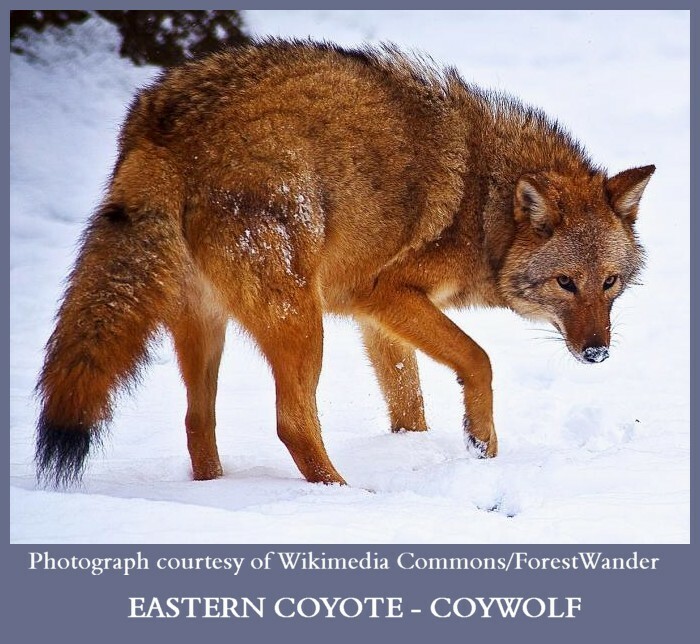 There are Lots of Websites that Discuss the CoyWolves. 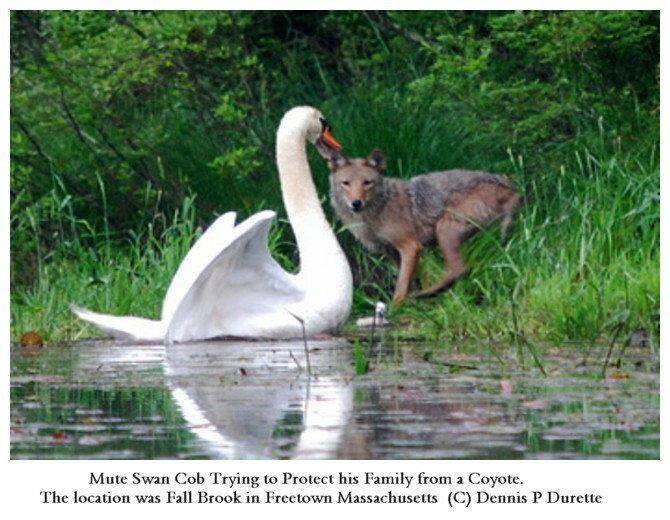 Mute Swan Cob Trying to Protect his Family from a Coyote. They are not Solitary Animals like the Western Coyotes. These Larger Canines will Travel in Packs and Hunt in the Day Time. Their Fur Color, Pale to Dark, has Lots of Variation. They LOOK like a German Shepherd with a Bushy Tail. hearing the Howling at Night and the Farm Pets being Attacked. 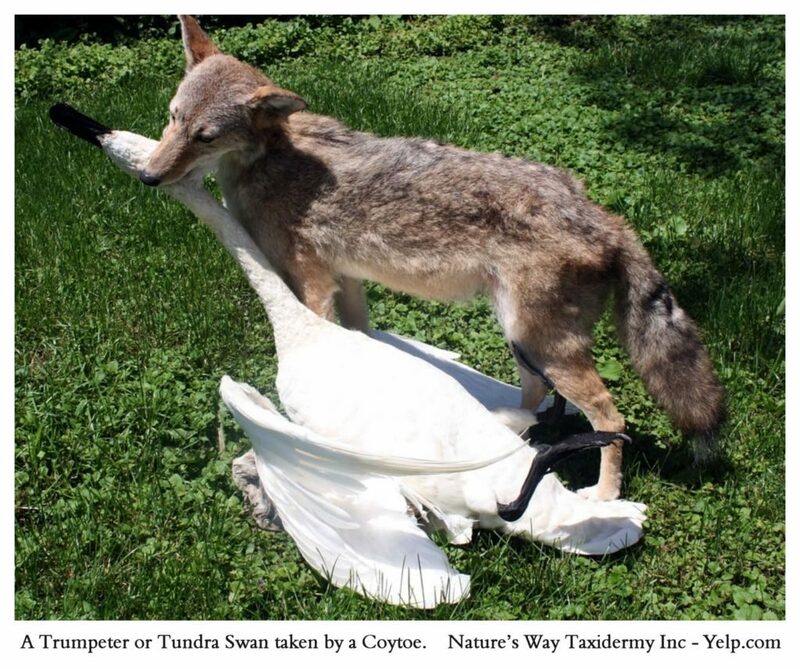 This WILD Trumpeter Swans was not Pinioned. But, it was NOT able to Escape being Snatched by this Clever Canine. 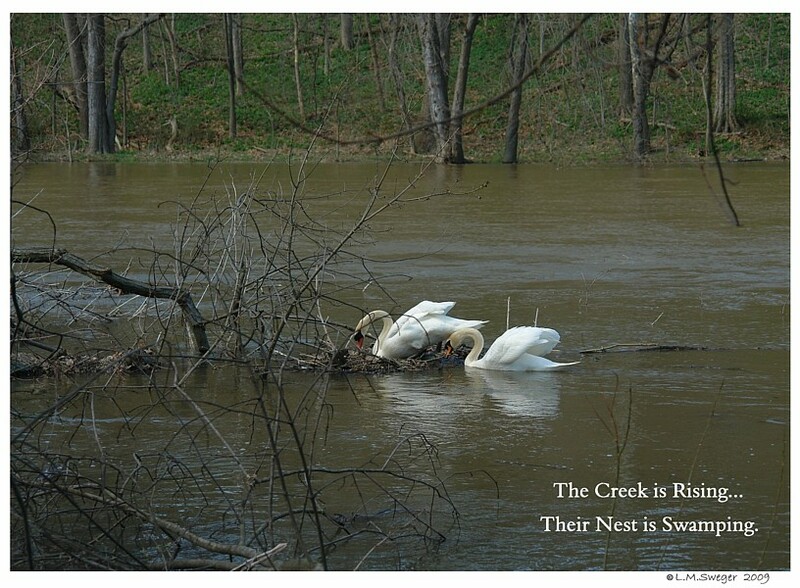 Areas have a Much Better Chance of Surviving Nesting Season. A Gate will be Needed at the Far End of the Bridge. at Spending their Night Hours Floating OUT in their Pond Water. 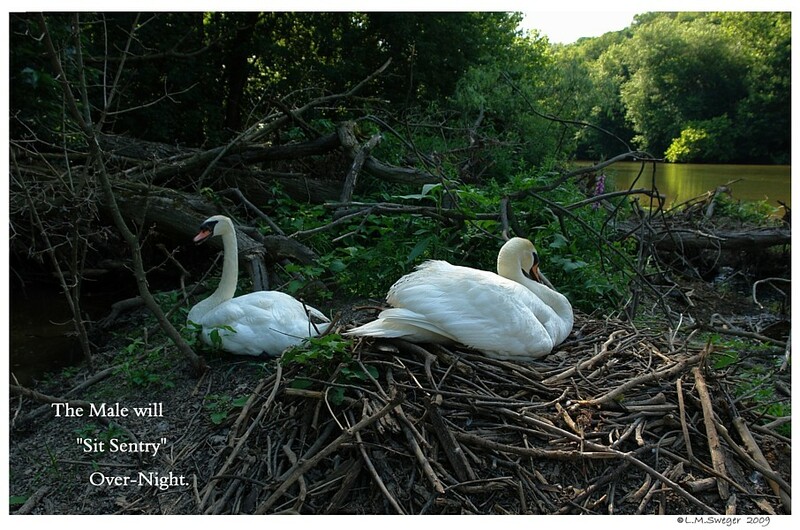 to “Sit” and Stay with their Nest & Eggs Day and Night. these Large Pack Canines. 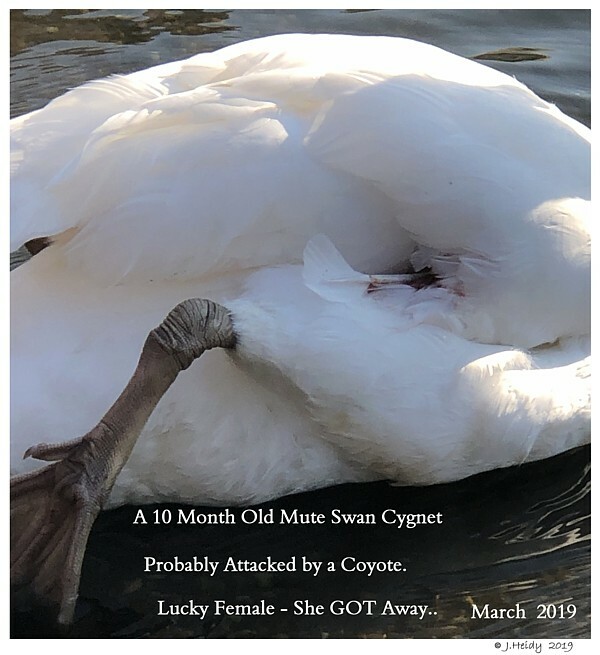 Our Swans are NOW at HIGH Risk. 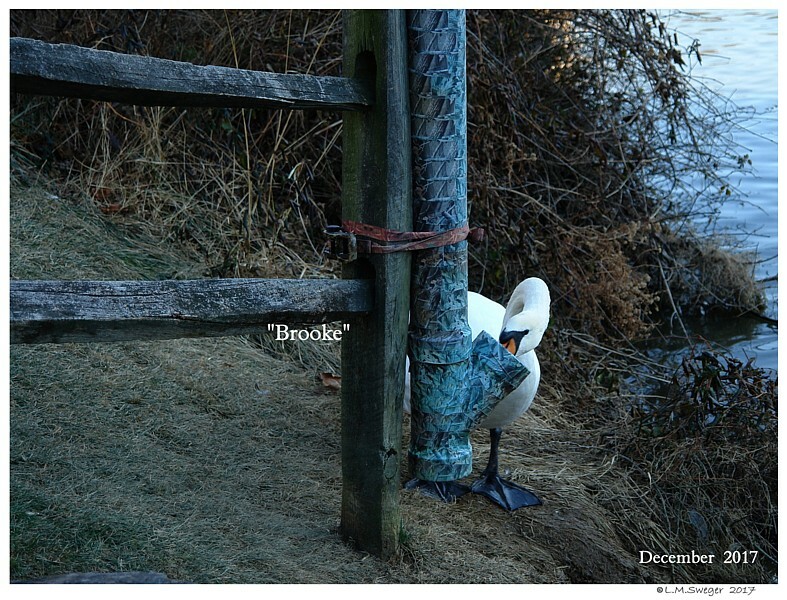 “Brooke” and “Meadow” will be 10 Years Old in 2019. 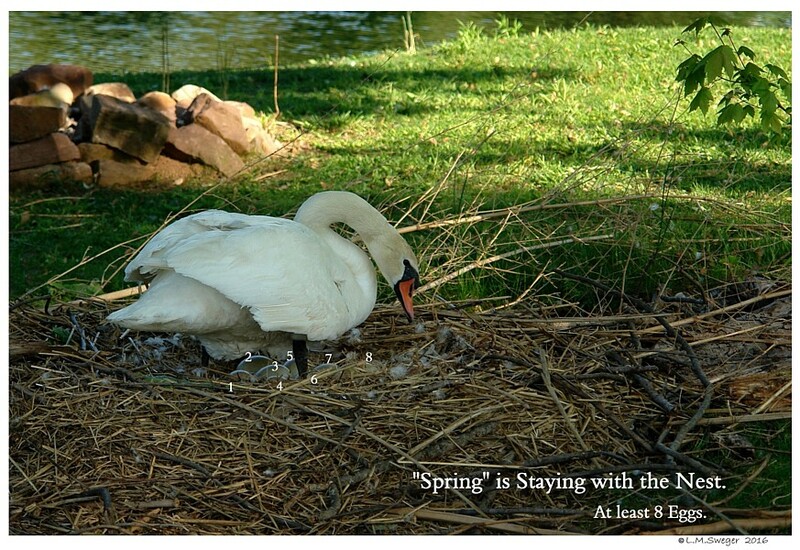 They have Nested each Spring starting in 2012. 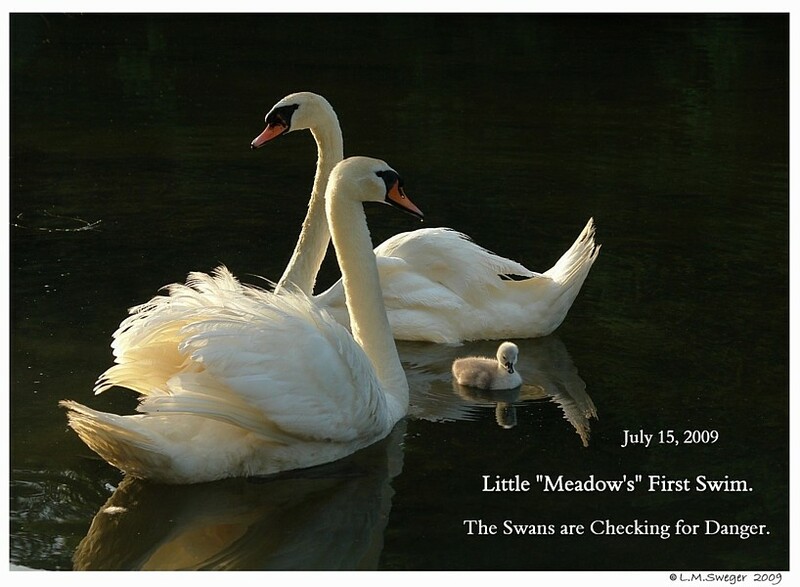 We have been Lucky, they have not been Injured or Scared from their Nests. 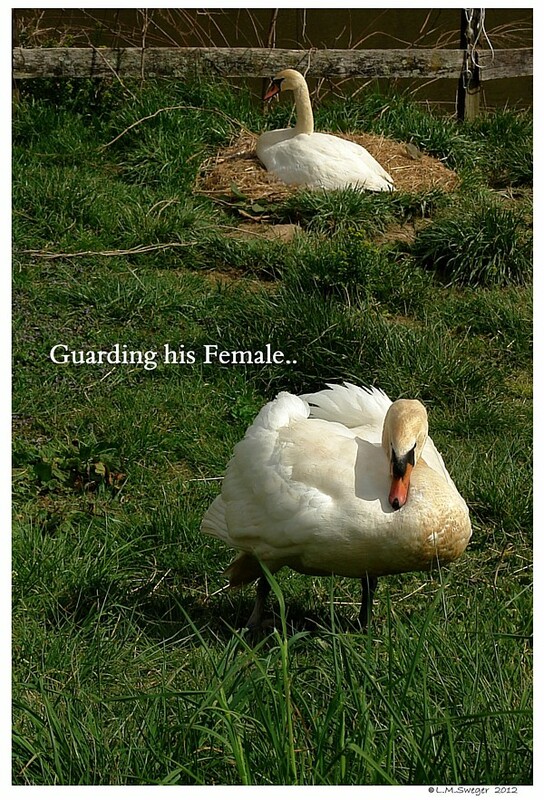 Many of their Eggs have been Stolen over the Years. The likely Culprits are Raccoons. I have made Replacement Eggs.. when Needed. they ALL will be Safer. At least from the Land Predators. SO>>>> I Decided I could not just allow them to be Killed. This May not Work. They May not be Willing to Use it. 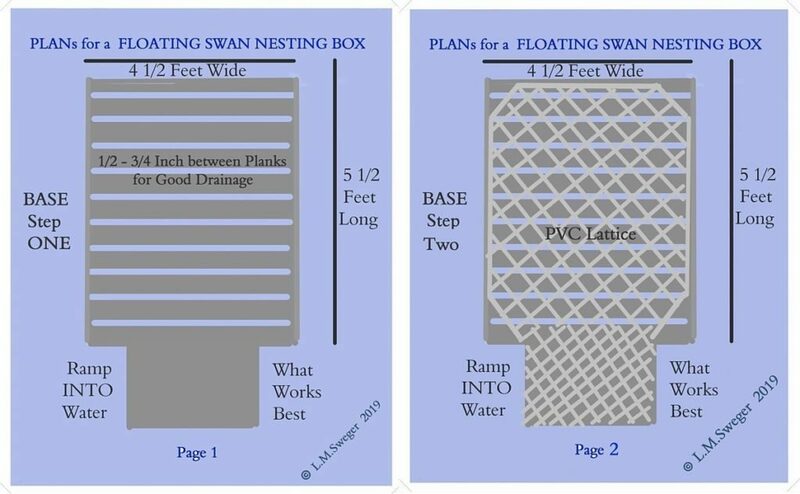 We are Trying and Hoping this Floating Nest Platform will Protect them. My Husband and I felt we could NOT do this Project ourselves. used his Skills to go from Paper Plans to Construction. Carrier to keep Everyone Safe from his Spring Hormones. 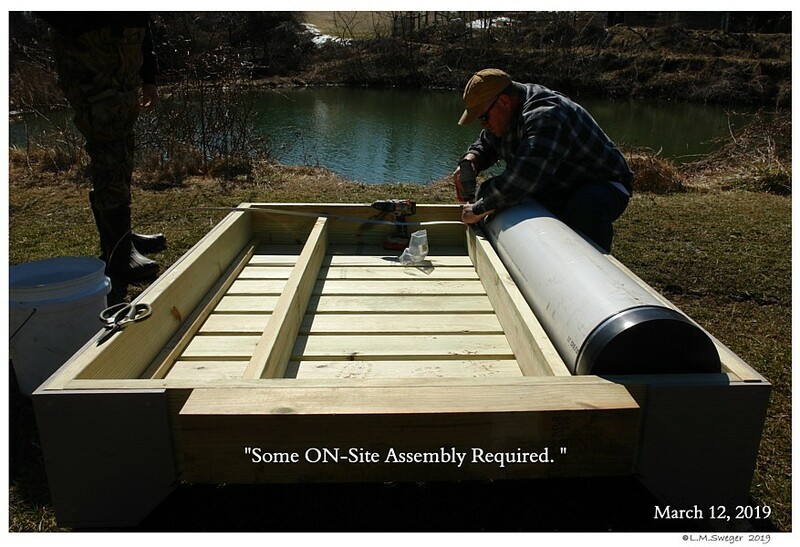 getting the Platform into the Pond. My job: Stay out of the Way. And try to get some Photos to Document this Project. 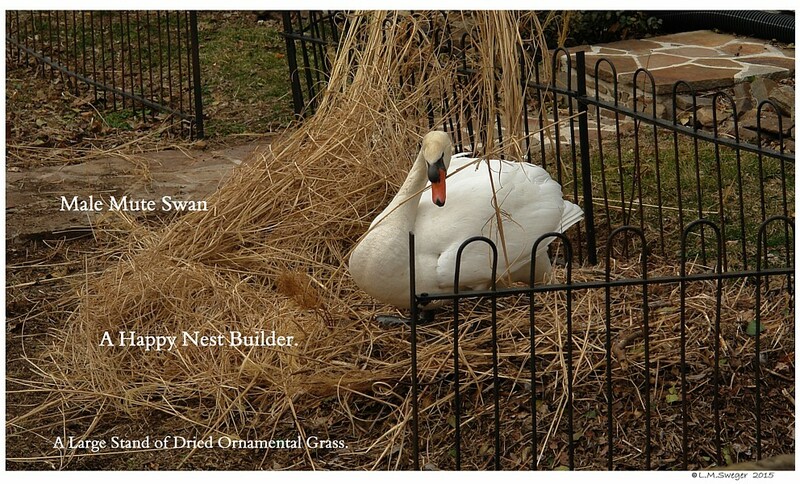 The Man who Built the Nesting Platform did a Wonderful Job. For his First time, it is PERFECT. Floats at the Proper Height. 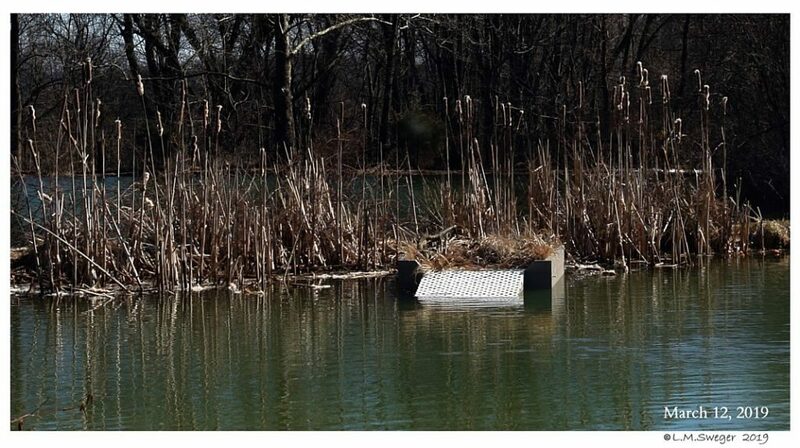 The Ramp Rests just under the Water for Easy Slide Up.. I am SO Pleased ! ! Now we need to get “Brooke” up on it. 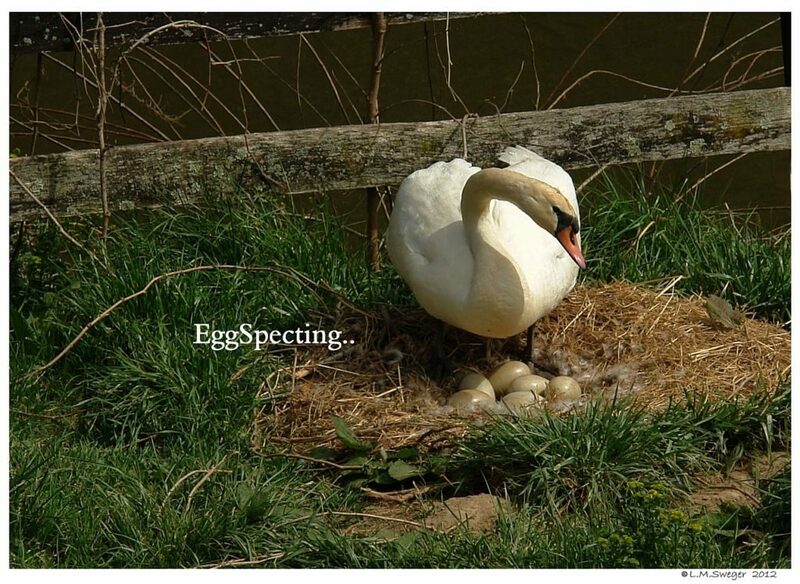 She is SO Close to Laying Eggs. Within the Week. 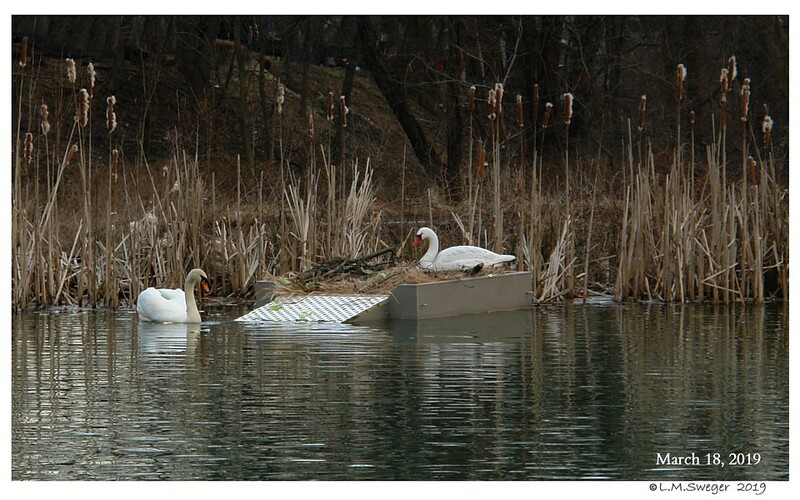 The Swans are Ignoring the “NEW Furniture” in their Pond. We are ALL Brainstorming how to get them to go UP on the Platform. 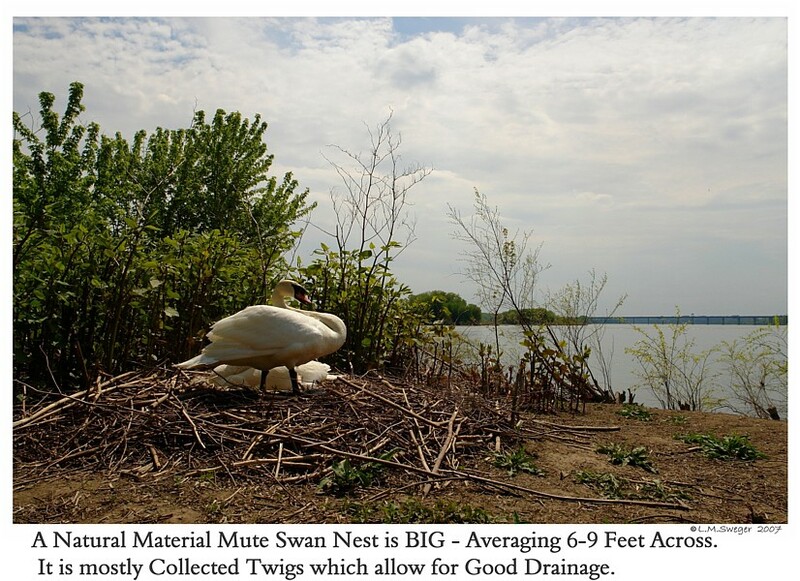 and Realize all the Nest Material they needs is THERE. we Placed a Dish Pan in the Back with WET Feed Mixture. I am Hoping the Waterfowl Pellet Feed will Smell Good. When it is Wet it Smells like Fresh Dog Food. 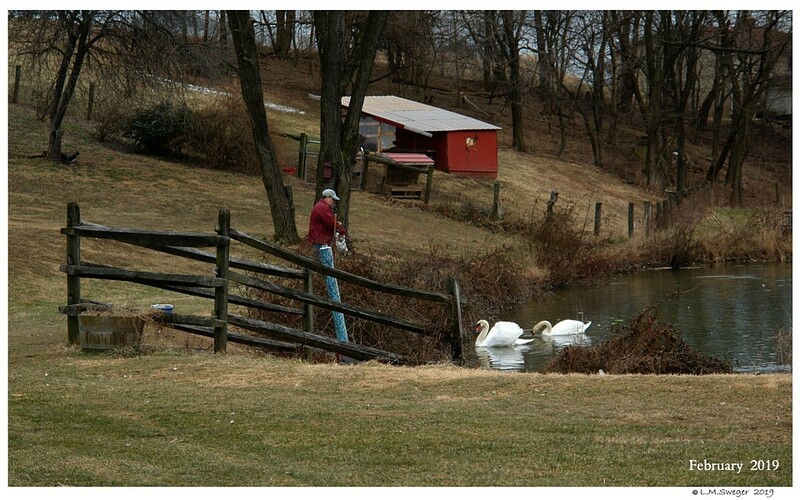 We have used Wet Feed to “Bait” Swans with Pretty Good Success. the Smell will get their Attention. 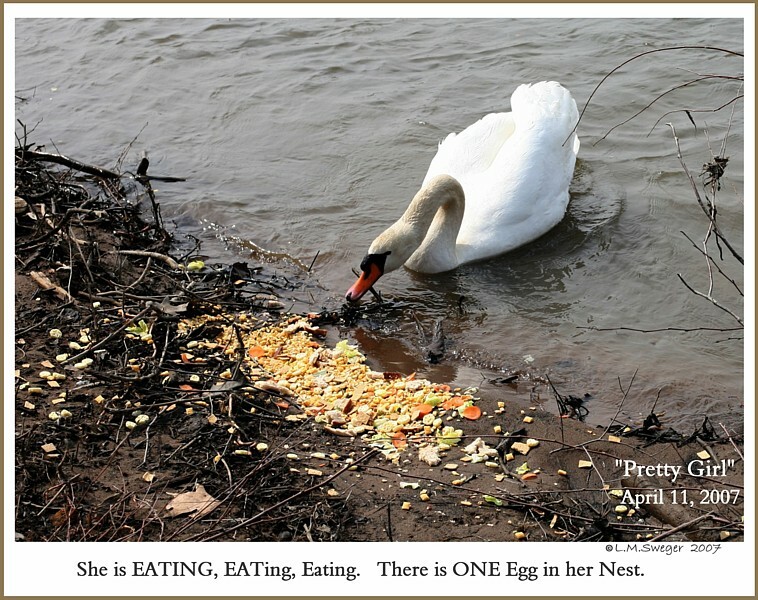 “Brooke” is Eating LOTs to get ready for Nesting. I am HOPING she will Smell the Wet Feed and GO Up on the Platform. Tossing Floating Pellets into the Water by the Platform. Flopping Lettuce on the Ramp and in the Water. 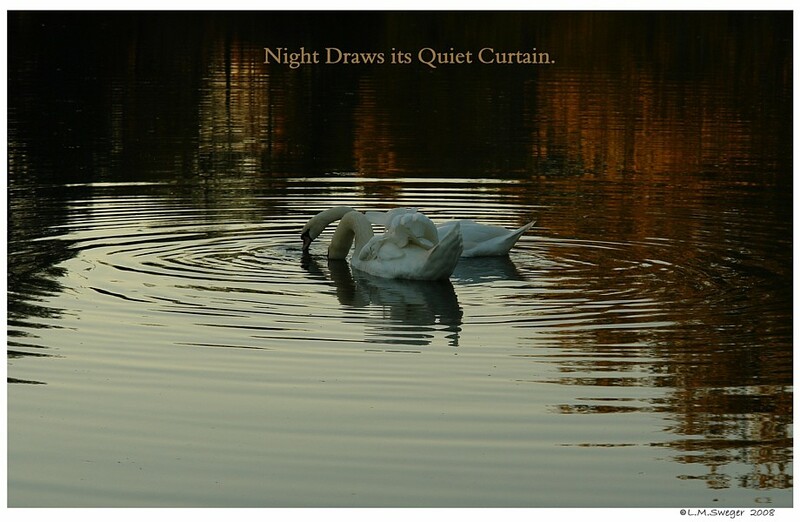 After Several Days.. NO Interest from the Swans. on the Platform.. 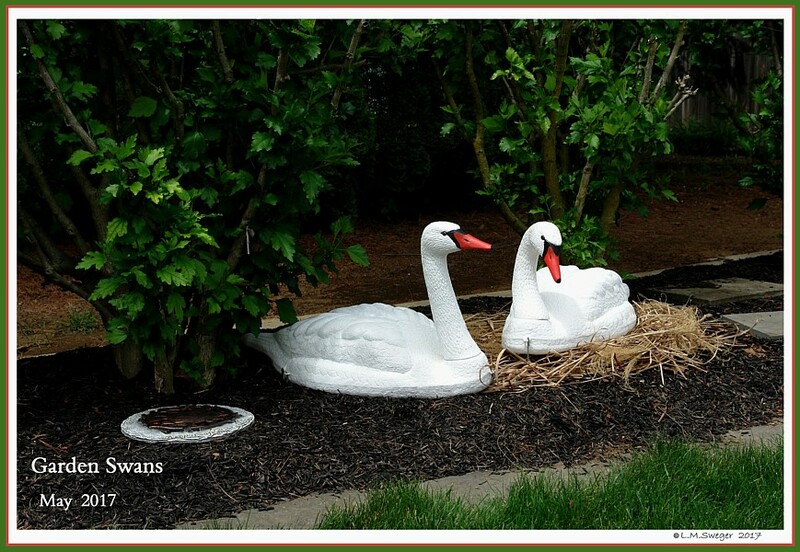 These are Pretty Close to Life Size..
WE Need the Swans to Climb up and Explore.. Fingers Crossed. 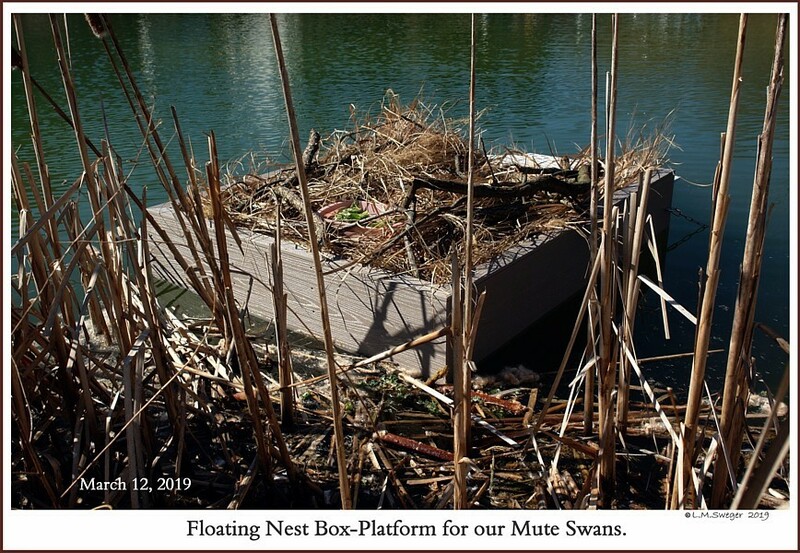 Another Benefit of a FLOATING Nest Platform. 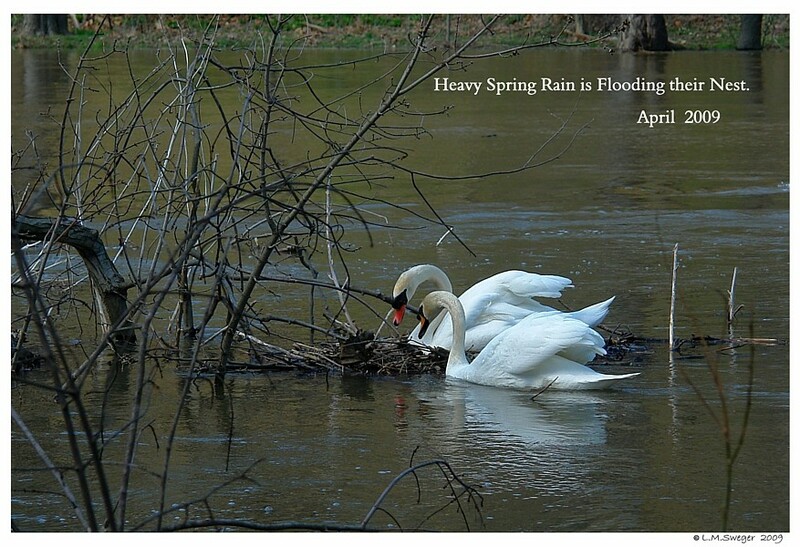 If there are Heavy Spring Rains, the Platform will Rise as Flood Waters Swell. 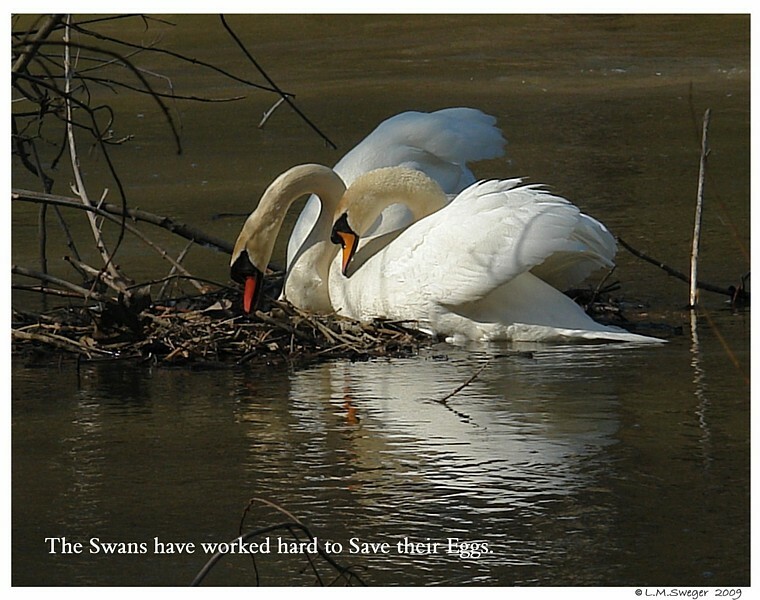 Each Year Many Swan Eggs are Lost during Spring Flooding. There are Several Images onLine. Several Commercially Available. If you are a DIY Person, there are Ideas.. 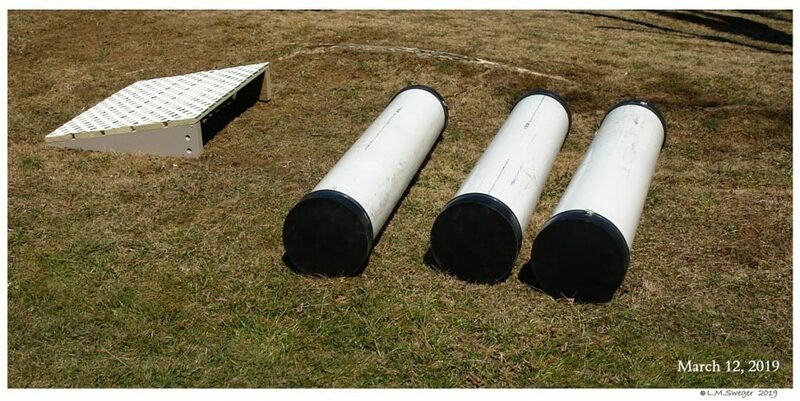 These can be Built. 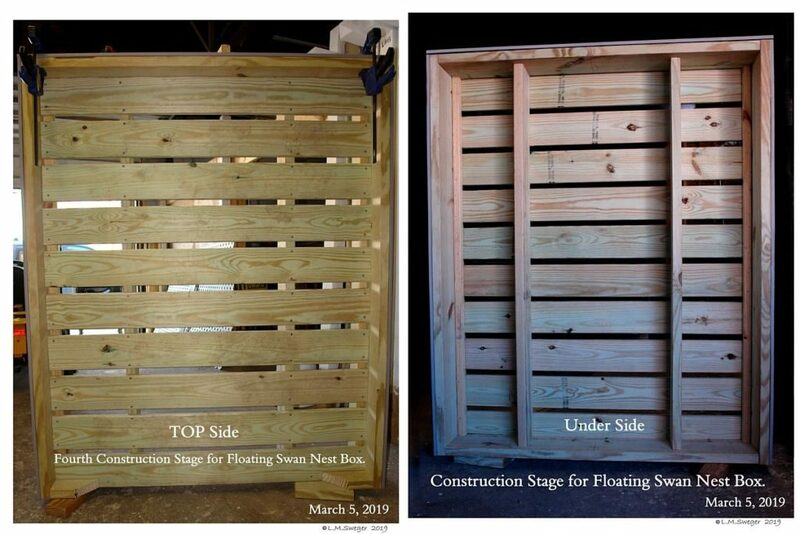 Our Structure is Mainly Pressure Treated Lumber. I had the Exterior Covered with TimberTech AZEK Composit. 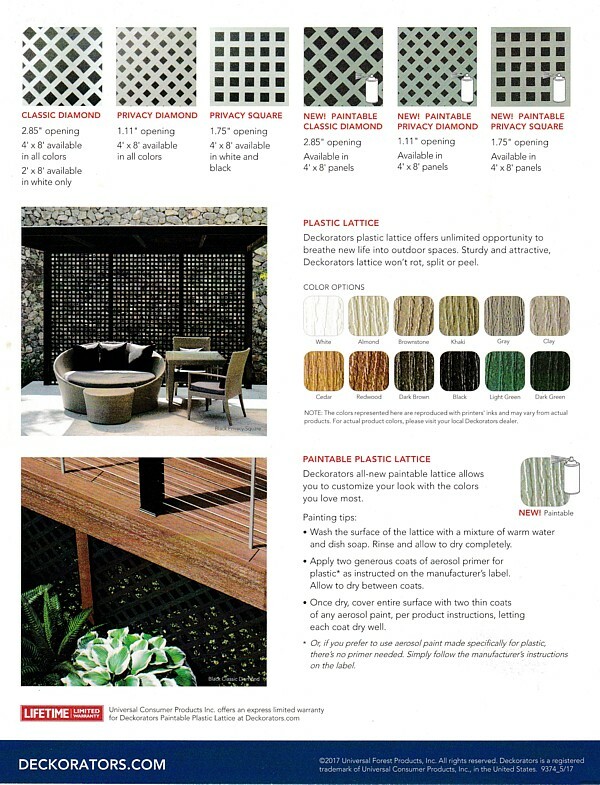 We have AZEK Material on our Deck – NO Painting. LOVE the Stuff. Much more durable then Wood. NO Splinters. We added Plasitc Lattice on the Walking Surface. This will Allow Toe Claw Grip and good Drainage. Double Sealed to Prevent Water Leaking in. ALL the Hardware is Stainless Steel..
ALL Screws, Screw Eyes and Quick Link Connectors. 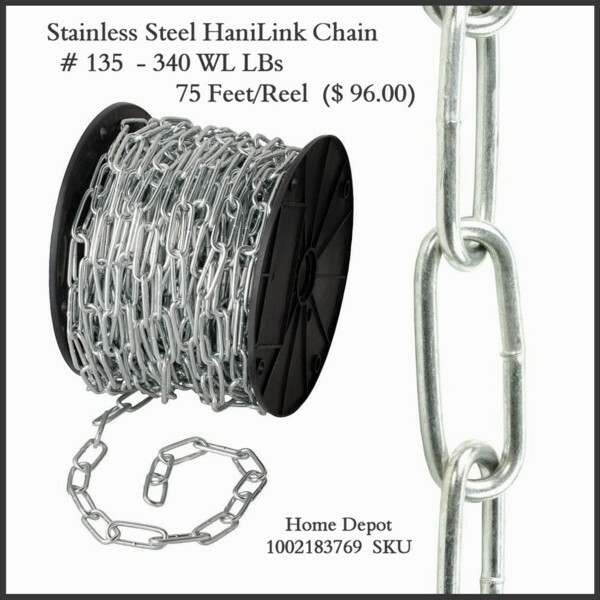 We Purchased 2 – 75 Foot Reels of Stainless Chain. 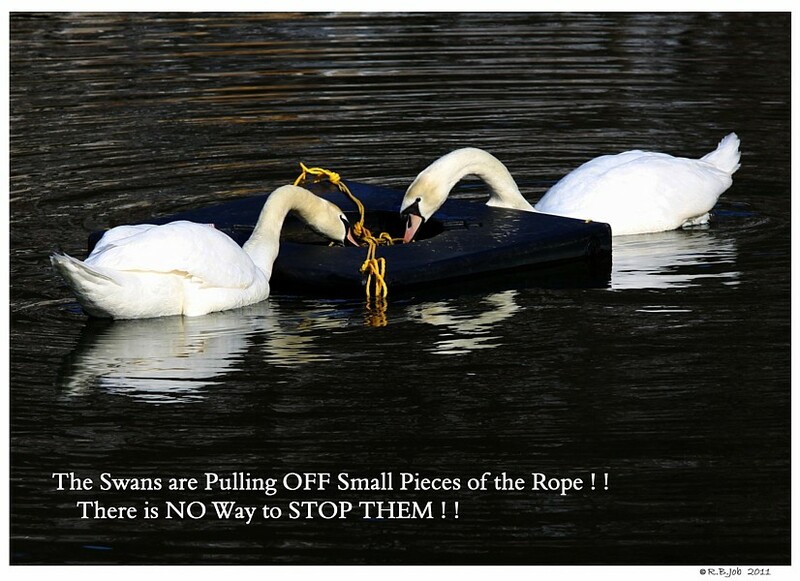 Chains are better – Swans will Chew on Ropes. 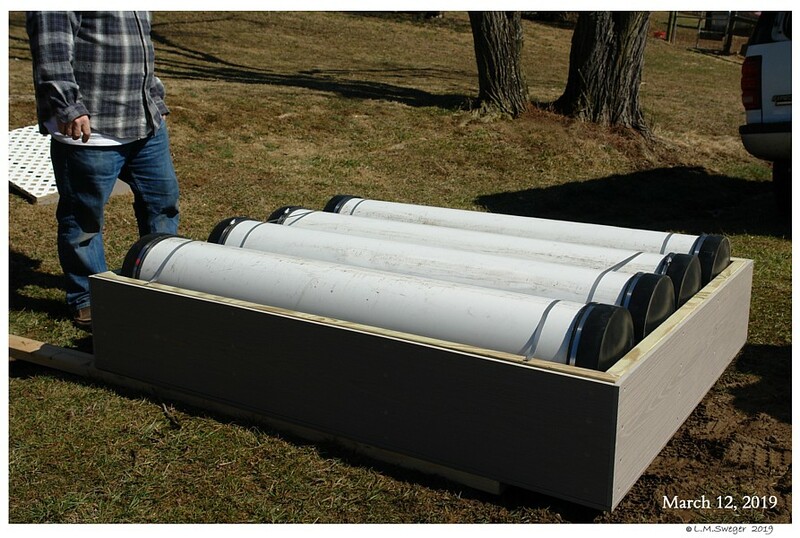 The Excess Length will allow us Freely to Move the Platform. 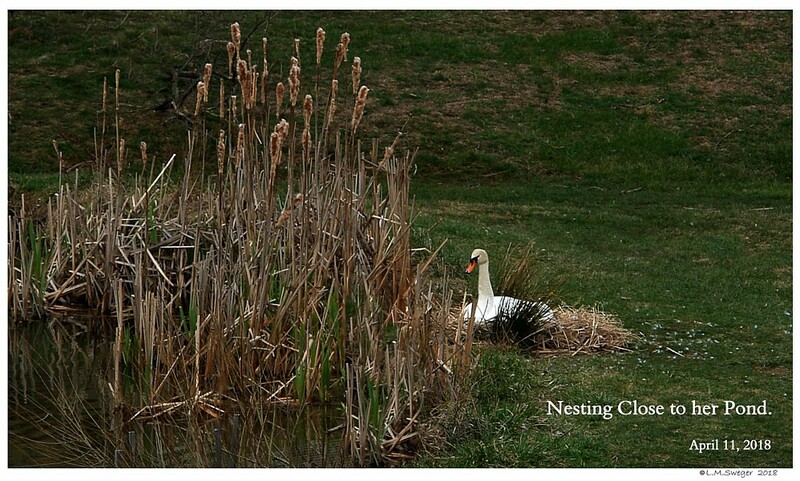 We will want to Clean it after Nesting. 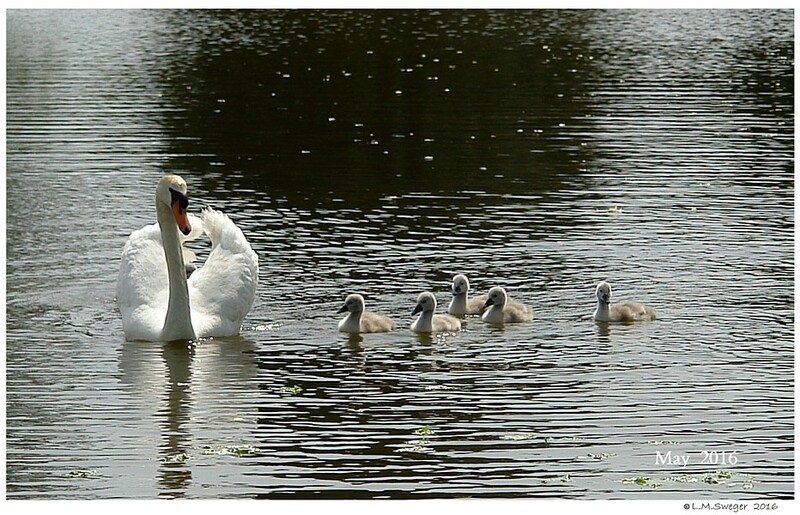 And, we might need to Check the Eggs without someone going out in a Boat. 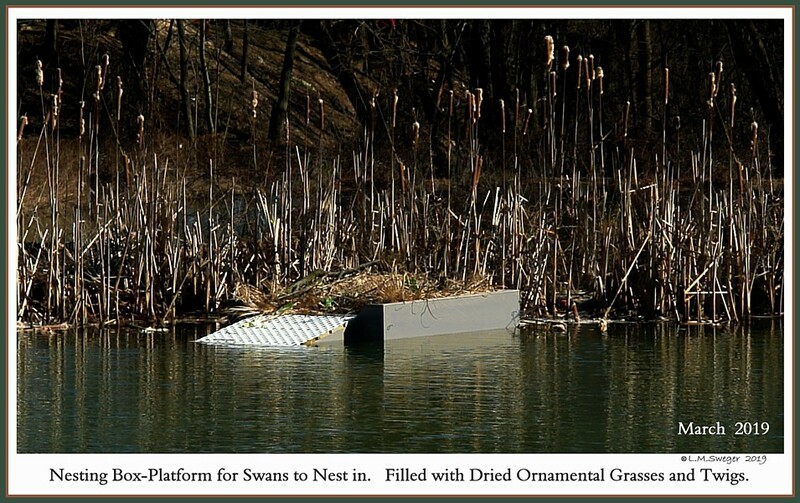 The Platform needs to be Anchored/Positioned out in Deeper Water. Try to have SOME Shade during Afternoon Hours. So, this is not a Solution for these Nest Raiders. 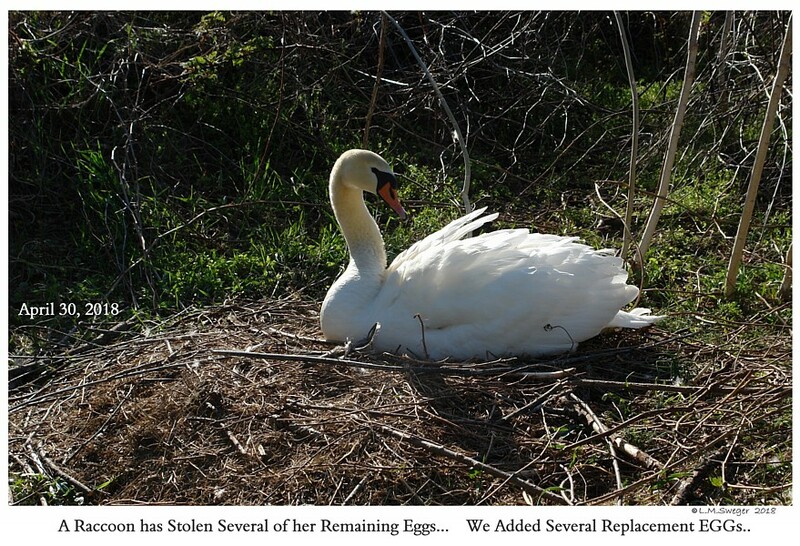 Our Swans had Eggs Stolen while Nesting on a Gated Island. 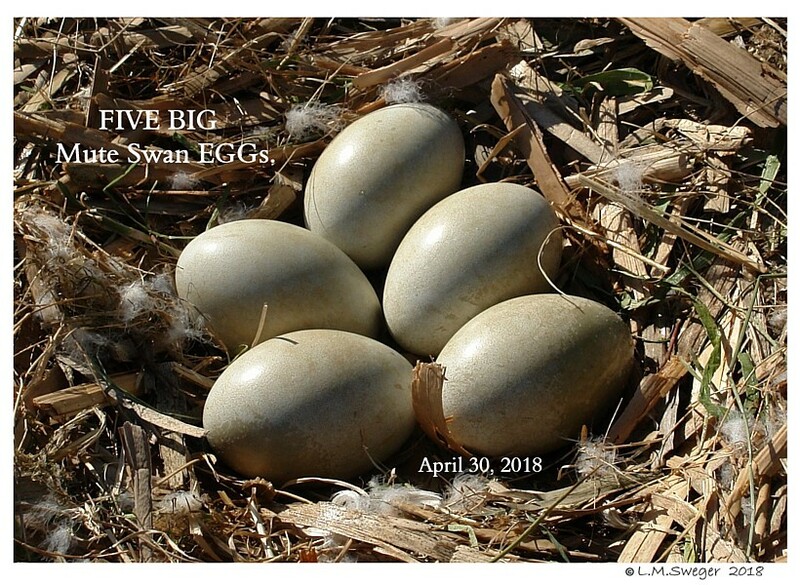 When we checked the Eggs over the Five Weeks, there would be about ONE Big Egg missing each week. 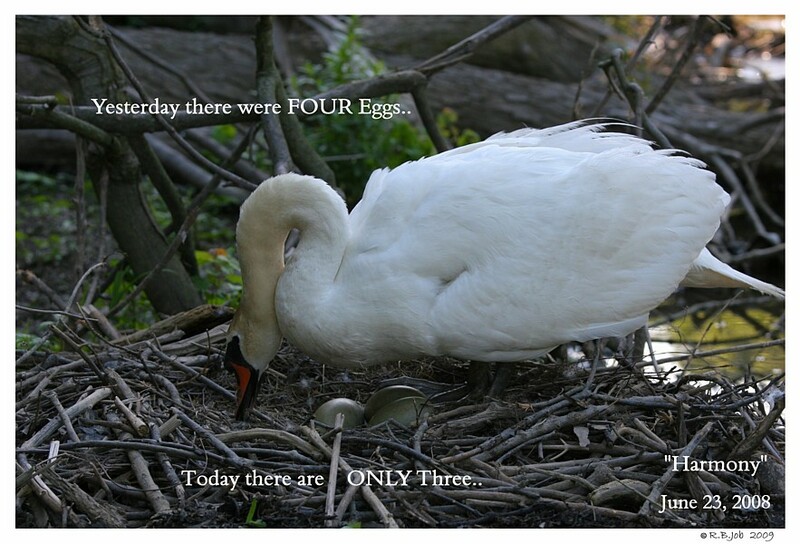 And they Lost MANY more Eggs while Nesting on Land. 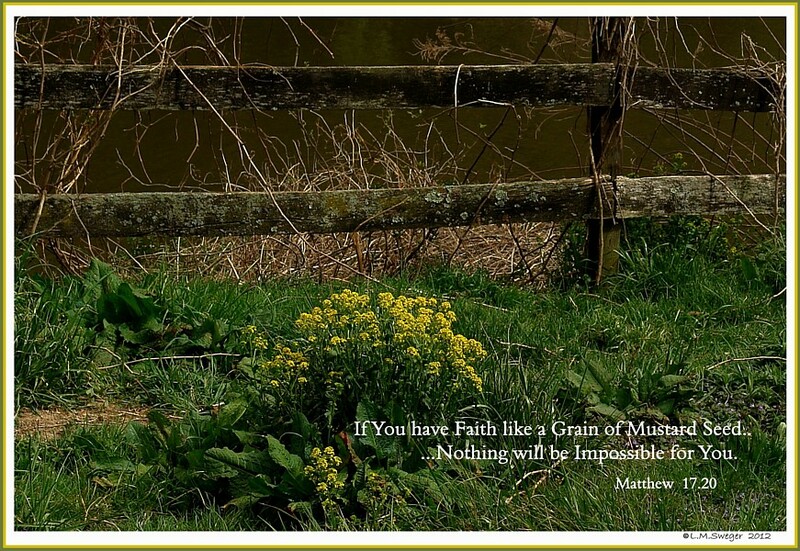 (C) Linda M.Sweger I Will Add more..Fingers Crossed. 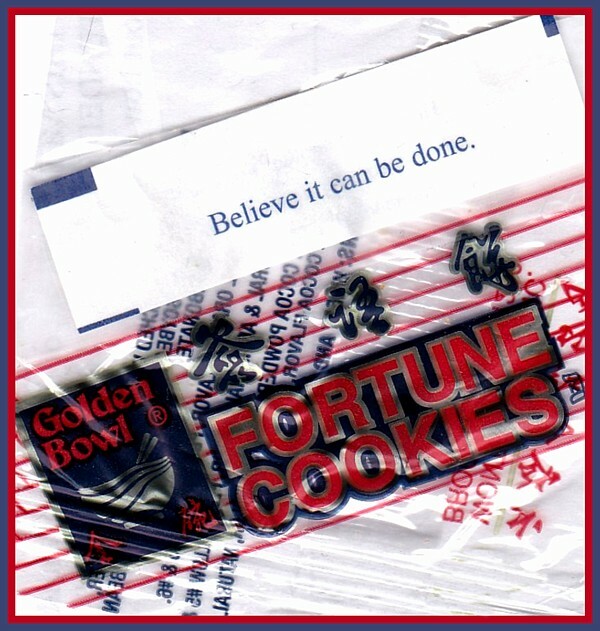 This was my Fortune Cookie Days before the Platform was Finished. 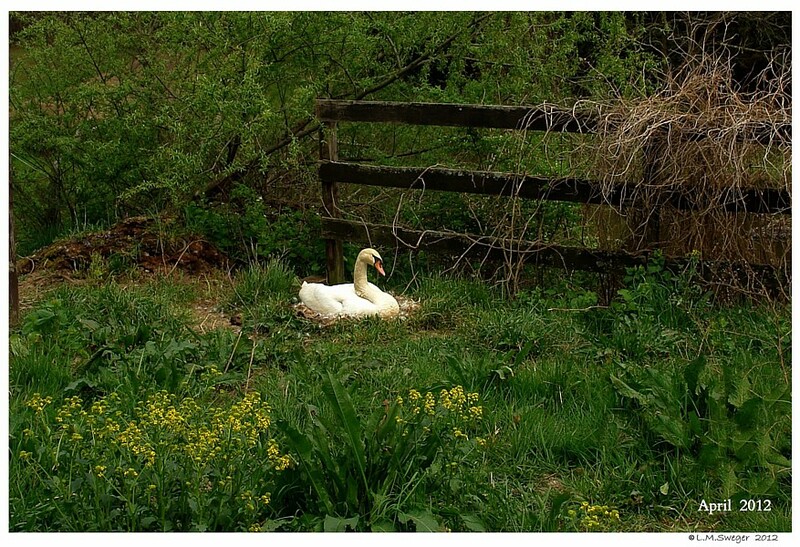 Before You let a Swan onto Your Pond. 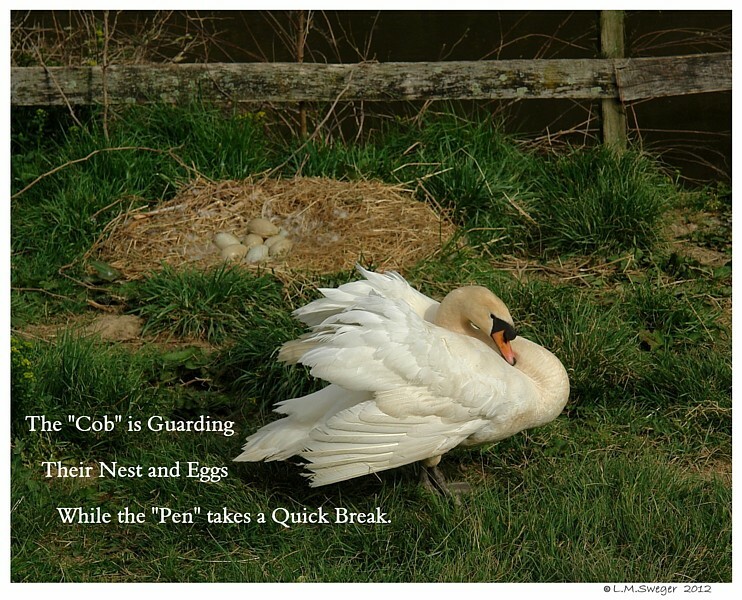 The "Pecking Order" – Who is the Boss ?? 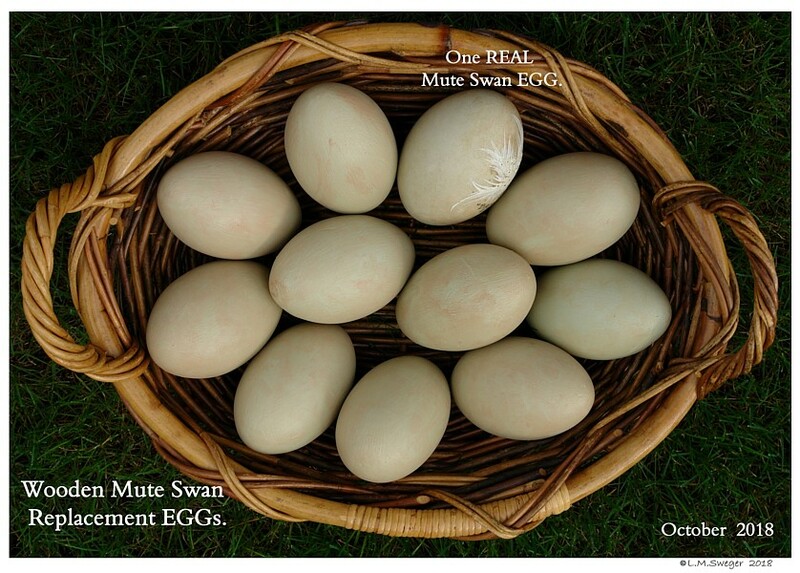 REPLACEMENT EGGs for Your Nesting Swans. SNAPPING TURTLEs are NASTY BEASTS.